Love this dishwasher! We have only had it for 3 weeks but compared to our old clunky dishwasher this is so much better! It's quiet, it is easy to load, it is easy to clean the machine itself and it makes the dishes sparkle! Great price in my opinion compared to those expensive ones and does just as good a job if not better! I also love that the door has springs so it doesn't just fall down when you open it so if you have to open it with one hand quickly it falls slowly down which is also always a plus when you have small children standing next to when you are doing the dishes. The cycle seems faster to me than previous dishwashers that I have owned if that's even possible. Highly recommend this machine. 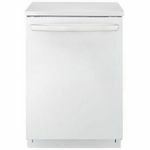 Very durable if you are like me and your refrigerator hits the dishwasher when you open it so far there is no dents! Very nice design too, simple and basic with a high performance. This cleans noticeably better than our previous dishwasher. A real test is regularly running 20 knives covered in peanut butter through it. The old machine left most of the butter dried on. This one cleans it at about 95% success even when I don't presoak/rinse. It's very quiet. The cycle is long, but that's not a problem. Another reviewer mentioned the middle section of the silverware holder is designed badly so silverware doesn't fit in it right. This annoys me too. The handle for the silverware rack gets in the way. the other issue we have is that the seal on the machine is super tight. That seems like it would be a good thing. The problem is if we don't run the machine for a few days, the dishes in there have no air circulation so they can smell funky. We either run an occasional rinse cycle, which is wasteful, or we leave the door of it cracked open but then it's a little in my way if I'm reaching for cabinets. LG dishwashers may have a bad motor. My strong suggestion is: "Do not buy an LG dishwasher!" 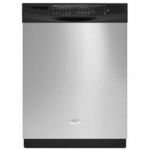 We have the LG dishwasher model 6920 and it never cleaned dishes well; but it stopped cleaning even acceptably two weeks after we bought it. The authorized repairman came and said we had a bad motor. He ordered a new one and installed it. 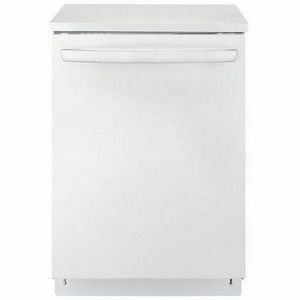 He said he had replaced at least one hundred LG motors and that he "hated" this dishwasher. Two days later, the newly installed motor started making the same whine-sound as the first. I called LG and explained why I was unhappy with their machine. They said they would not authorize a return unless the dishwasher was deemed "unrepairable" by one of their representatives. I explained that I thought they had a bad motor design and that the dishwasher would never run well for long. We bought it because it had a low decibel number. We now think that not just our model is a lemon, but all the LG dishwashers that use that quiet motor, which may be all of them. We purchased the LDF6920WW in October, 2008 Within 60 days we had 2 service calls to adrees the issue that the machine did not clean the dishes very well. Dishes end up with food particles with almost every load. Since then we have had 5 service calls to adress the issue and every time the tech sez it sounds right so nothing is wrong. In spite of the fact that LG has actually extended our warranty twice they still will do nothing to either replace it or give us our money back. 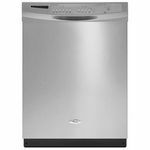 I was actually told by one LG customer service rep that "since your machine seems to be in working order we can't do anything about your dirty dishes"
We purchased an LG diswasher model LDE6920ST 2 months ago. It hasn't gotten the dishes clean yet. The serviceman has replaced the sump and the board and it still doesn't work. 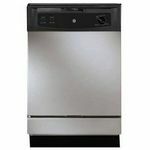 LG is stuck into this routine of sending service people out over and over rather than replacing the defective dishwasher. Everytime the service guy comes, he has to order parts that take forever to get here. I'm washing dishes by hand for the first time since 1977. I wouldn't recommend anyone buy an LG. Their service department isn't reliable. We have recently moved into a new home and the best part about closing was going to purchase all new appliances! We were looking for stainless steel and our local appliance store sold us on LG. We have this dishwasher and it runs daily. I am a mother of 2 under they age of three and do not have the time for any problems! We have had none so far with this dishwasher. It cleans the dishes perfectly and has steam dry feature which is perfect for baby bottles! There is a little ding sound when the dishes are clean, but that is the only sound you will hear from this machine! I guess if I had to complain about something it would be the fact that while cleaning on the edges of the handles, I noticed that alot of dirt and grime builds up in the creavaces. Other than that, perfect in every way! Thanks LG! I really like my LG Dishwasher. Its so quiet most of the time no one even knows its on. This is the one quality that still blows me away. The dishes are usually really clean without rinsing them first. Starches, like potatoes, don't come off completely clean. We have to be sure starches are completely rinsed off before putting them in the dishwasher. You also have to use the drying agent. If you don't use the drying agent all the dishes look terrible. On the flip side with the drying agent all the dishes come out spotless. We really like how sparklingly shiny everything comes out of this dishwasher. The washer also has an amazing capacity. We have been able to fit all the dishes from thanksgiving for 8 (including the cook ware) all into one load. You got to think that filling it up every-time is saving tons of energy. It is an energy star appliance. We really like the stainless steal look. Its a great dishwasher. LG is the Best Dishwasher I have ever owned. We re-modeled our kitchen 5 years ago and put in all stainless steel appliances. The original dishwasher broke within two years and we purchashed the LG as a replacement. I did not realize it at the time of purchase, but the interior of this machine is enormous! I can fit large pots and many, many more items than in my previous machine. Also, it runs quietly. The best feature in my opinion is that it does what a dishwasher is supposed to do - It cleans the dishes! I NEVER have to re-wash or wipe off anything that comes out of this superior machine. I do not pre-rinse my dishes and they are always super clean. I have a second home with a Bosch dishwasher and I must say that I prefer the LG over that one, too. If I could change one thing about this dishwasher, it would be the cycle of washing. It seems very long, but that is the standard in the newer machines. The normal cycle takes a long time and there is no alternative, except for delicate. Perhaps LG could add a "light" cycle? Definately my favorite machine overall! 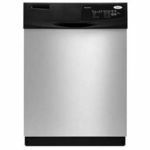 The LG Dishwasher is Worth Every Penny! This dishwasher is worth every penny. The look of this dishwasher is perfect. The stainless steel look is very easy to match with the things inside the kitchen and the way that it looks is very modern. The buttons are hidden on top of the dishwasher and will not get pressed accidentally when you are working in your kitchen. Another good quality is that it is very quiet and has so many different options to choose from when you are trying to clean the dishes. I've never had problems with the dishwasher and it does a great job in cleaning. There is a lot of space to load the dishes, pots, pans, and the utensils has its own separate container which does not take up any space to put other things in. I would definitely recommend this product to people because it won't break your bank, it's a new look, it is quiet, we get tons of compliments for our guests, and it has not broken yet and i've had it for over a year. It truly is a great purchase.